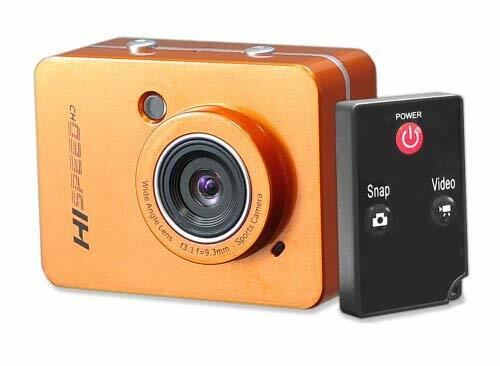 I purchased this camera for a class science fair project to accompany the GoPro Hero3 that I had also purchased. I’m a teacher and we mounted this camera to an apparatus that went into the upper atmosphere. The Pyle camera costs less than the GoPro, and I am pleased to say it performed just as well if not better than the GoPro. The camera came with the remote and the LCD screen is a nice feature to have. It lasted longer during the flight time recording than the GoPro (a little over 2 hours of continuous filming at an altitude over 60,000 feet) and the quality of the video was fantastic. If you are looking for a cheaper alternative to the GoPro you will be pleased with the Pyle camera. Very easy to use and operate. It’s trash. I wasted my money. This thing can be charged for hours and will die in seconds after being unplugged.If you push the SD card that IS NOT INCLUDED in too far, it will cause the camera to black screen until it either runs out of battery, or is removed.If the SD card isn’t pushed in enough, it will not read in data properly.The SD card does not lock into place and seemingly gets pushed out, I literally had to tape it shut. It worked for about 30 seconds. 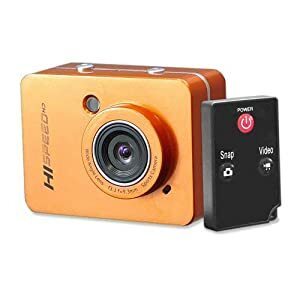 Then when I put it into the waterproof case in order to actually RECORD something, the camera black screened, because the case pushed it in too far, then quickly died from loss of battery. This all took place in the span of 4 minutes.Very cheaply made, and 1080p does not look like 1080p, it looks like 480p. This is coming from someone with a lot of experience with video editing and done professional editing before, with a year of youtube experience. I purchased this item because I have two very similar cameras that were rebadged under a different brand (Gear Pro), but pretty much the exact same camera. They had pretty decent quality, especially for the price, so I picked this up because it had the extra “high-speed” option. The product description neglected to mention the “high-speed” option was VGA resolution, so the equivalent of video taken by a solar-powered calculator. This was unfortunate, but not a deal breaker.The true deal breaker was the fact that the battery refuses to hold a charge. I’ve tried charging it with multiple different chargers and USB cables and out of different outlets, and with varying times (from 30 seconds to 2 hours), all to no avail. I can only operate the camera while it is actively plugged in, which means at most I can use it as a dash cam, not as a free-standing unit. Even with dash-cam duty, it’d often take upwards of a half hour to turn on, and 50% of the time it would glitch out on the loading screen. The only way to fix it was to let the battery drain out (which fortunately doesn’t take too long).Because of how cheap it was to purchase, it wasn’t worth going through the effort of fighting with support to get a replacement unit/battery. My experience with this camera is not a good one, and I wouldn’t recommend it. I love that I get a great camera for $30. I have two of these that I have mounted in my car (front and rear). This blue one, for some reason, has really bad audio. Not sure if theres a loose wire in the mic or what. And being in my car, early morning and late night recordings are almost nonexistant. takes great quality photos and I love that it comes with almost all the mounts you could want. Just need to find an thread to “GoPro” style and I’d be golden. Now it’s not recording in Uber-High-Def, but the videos are decent quality. It takes great photos, but I feel like most smartphones can do about the same quality or better. Sure they’re not submersible like this is (in its case), and they cost more. but for the $30 price tag. I would buy two or three more of these. You can stick them anywhere. about as big as a GoPro HeroSession.